Home » Horror » The ​W​erewolf. Great movie filled with thrills. A chilling drama that focus on the curse of the werewolf. 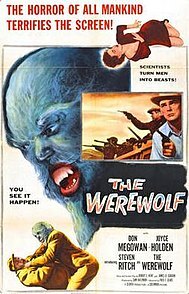 It’s about a dude who wonders into a small town haunted by the fact that he just killed someone, and as willing as he is to confess to the murder all evidence points to a large beast killing the victim and nobody really wants to admit that this dude is a werewolf no matter how much the evidence points to this. It’s a cheap movie so the best we get is a werewolf mask when it comes to make up and special effects, but impressively the plot about the lore of the wolf curse was done so well that it’s superior story is actually what makes the wolf mask look cheap when we finally built up all the way to the big reveal. Comes as a double feature on a DVD with ​Z​ombie of ​M​ora ​T​au. Must have been made by the same company​ ​(​A​actually ​by a guy named Sam katzman)​.​ ​I​t​’s ​got the same quality. Think the DVD was trying to give us the double bill ​B​-movie experience as the bonus features ​come with a ​ a short film called ​M​idnight ​M​ongols that seems to poke fun at how racist the world was towards the Chinese ​back in the day​. Not fully racist so it​,was easier to laugh at​ the two main characters making asses out of themselves by assuming things about Asians . Midnight Mongols starred two white guys who looked like they may have been a great comedy duo in the 50s but no ​Abbot and Costello or ​​Stan and Ollie, cause I don’t recognize them (So their comedy did not last the test of time?). ​Wonder if anyone 50 years from no will remember Ben Stiller and Owen Wilson or James Franco and Seth Rogen as great comedy duos? ​The DVD also came with a really short ​M​r. Magoo cartoon that had no redeeming quality​ to it other than to mention that it made me feel like I was having a perfect Grind house night. All that was missing was a music video concert by a big band and a Movietone News Reel.